The M3 Micromechatronics design platform combines a SQUIGGLE RV micro motor, position sensor, the drive ASIC and a microprocessor in a miniature, closed-loop motion assembly. 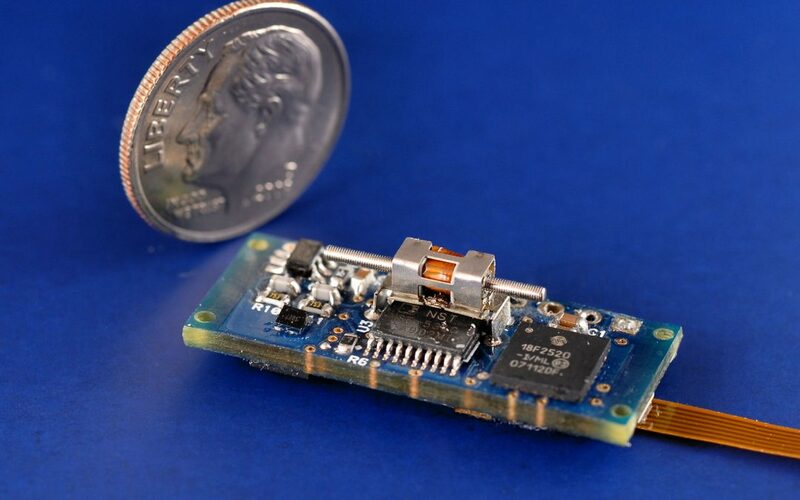 Dramatic reductions in voltage and power requirements are making tiny piezo motors and drive systems an interesting option for portable, low-power medical devices. 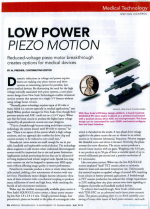 By eliminating the need for the high voltage normally associated with piezo systems, a new piezo motor design from New Scale Technologies enables miniature motion systems that operate on a single 3-V battery without using voltage boost circuits. “Normally piezo technology requires input of 40 volts or more, which is a concern especially in medical applications,” says Ralph Weber, product manager for New Scale. Even though their previous systems and ASIC could run on a 3.3-V input, Weber says that the boost circuits to produce the higher input voltage required by all piezoelectric motors can scare designers.